Technology solutions can drive significant operational performance improvements to any delivery organization. Nearly every critical KPI can benefit from improved automation, ranging from better project performance and increased staff leverage to improved billable utilization. Just a couple of points of utilization improvement for a 250-person organization can bring $1M annual improvement to your bottom line profitability. This is more than enough justification for action. With a complex array of software solutions available to address these needs, the average company must invest substantial time and effort finding the right answer. 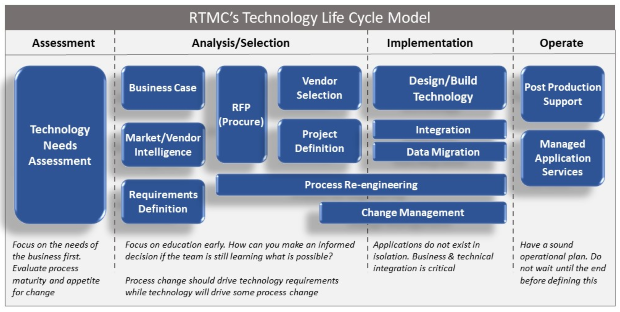 RTM Consulting can assist your company with its broad range of services that span the entire decision and deployment life cycle. We offer a full breadth of technology services ranging from strategy to implementation and managed services. Click below to learn more about how RTM Consulting can help your company. Improving automation and introducing new technology can be a game changer for organizations, but it requires strong up-front planning and thoughtful evaluation and definition of the bigger picture. Our Application Implementation Services support project activities related to the solution installation. We can assist companies with project management, change management, process improvement, and integration to ensure the implementation is a success from a people, process and technology perspective. Improving automation and technology is typically not an isolated, or silo’ed event. Applications these days rarely operate as a stand-alone, relying on integration with other applications to provide their greater use and value. 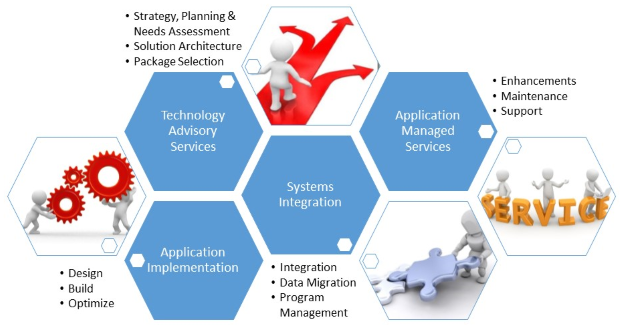 Our approach to define and implement a technology solution is comprehensive. We can provide services across the full technology solution lifecycle or offer discrete services at various entry points. Contact RTM Consulting to gain access to our insights and experience with this critical aspect of running your business.